KFC is bringing back the Double Down, a bacon and cheese sandwich that uses two fried chicken filets as a bun. KFC is bringing back the Double Down, a bacon and cheese sandwich that uses two fried chicken filets as a bun. But like a spring chicken, it won't be around for long. "Yes, it's true! What is arguably the most talked-about product in KFC history is coming back, but only for a limited time," said KFC spokesman Rick Maynard, in an email to CNNMoney. He said the Double Down will be on the menu nationwide from April 21 to May 25. The news comes just days after KFC unveiled a chicken corsage for prom season. The corsage features a wristlet of flowers that comes with a gift card that the recipient can use to buy chicken at KFC. 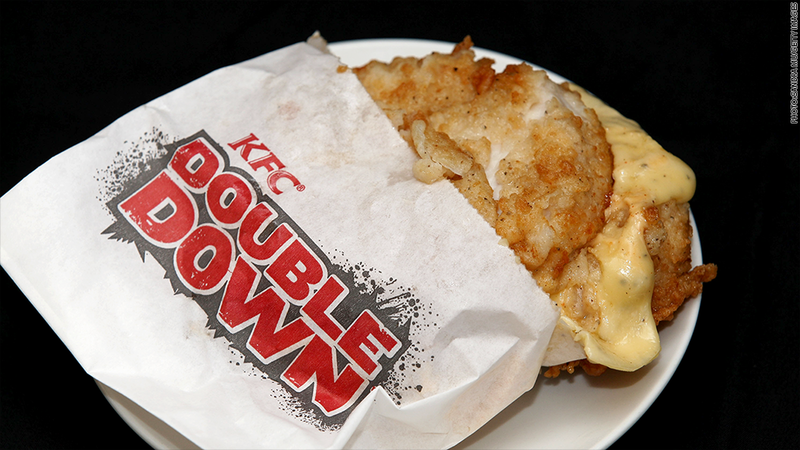 The unique Double Down sandwich was a big hit when it was first unveiled back in 2010. "It includes bacon, Monterey Jack cheese and Colonel's sauce sandwiched between two 100% white meat Original Recipe filets," said Maynard. Yum Brands Inc. (YUM), the parent company of KFC, only made the sandwich available temporarily before yanking it off the market. "KFC sold more than 10 million in the first month when Double Down launched in 2010," Maynard said." As a result of that popularity, the product remained on the menu past the end of the original promotional period." Back in 2010, Yum Brands Chief Financial Officer Rich Carucci referred to the sales as having an "immaterial" impact for the overall company. Double Down may be following in the popular footsteps of McDonald's (MCD) Shamrock Shake, a neon green frozen drink that spurs a sales frenzy when it's offered seasonally.